Looks like it’s kitchen week around here! 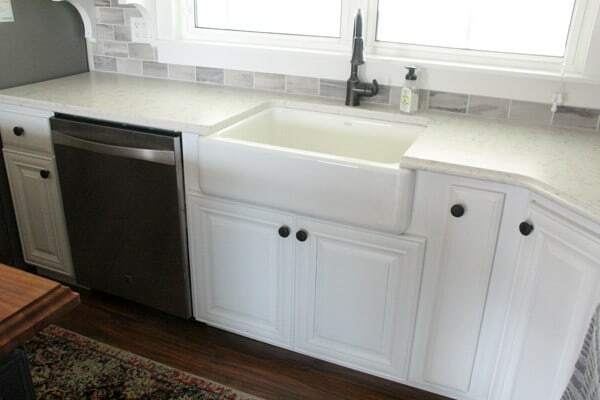 First I shared our butcher block island, then yesterday I shared about our new farmhouse sink. 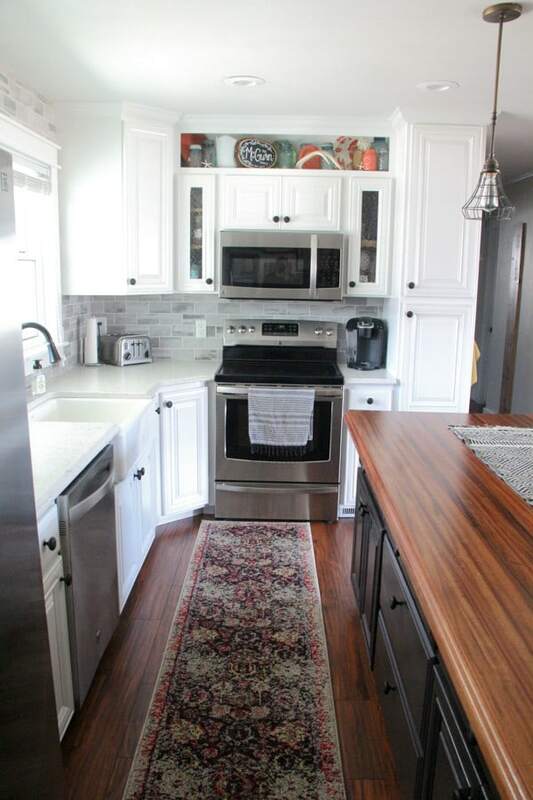 Now today I am sharing the counters and the backsplash, finally! 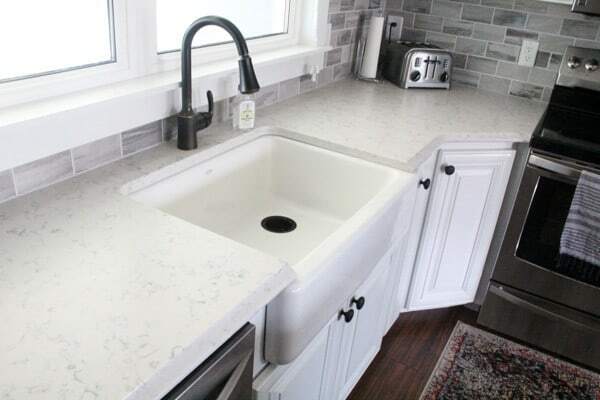 We went with Silestone Lyra Quartz Countertops with a sueded finish and ogee edge. It was definitely the biggest splurge of the entire kitchen, but also one of my favorite updates. 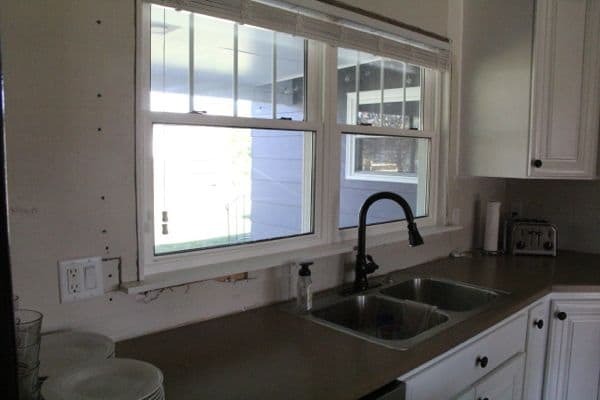 Ever since we installed our bigger kitchen window we’ve had this unfinished drywall behind the sink. After a year of this look I was SO ready to get this backsplash done. Once the counters were installed we got busy working on the backsplash. 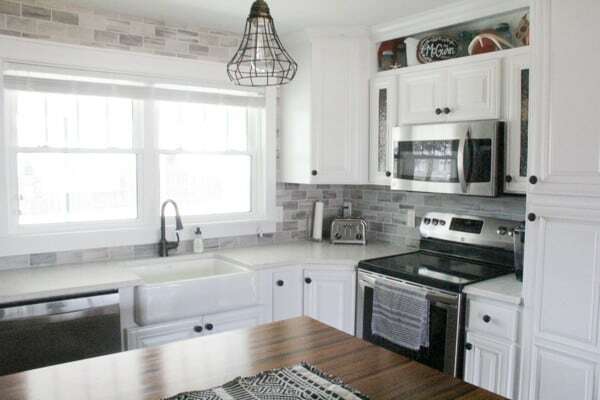 We used “Ancient Gray” Ceramic Subway tile from Lowes with Gray Grout. 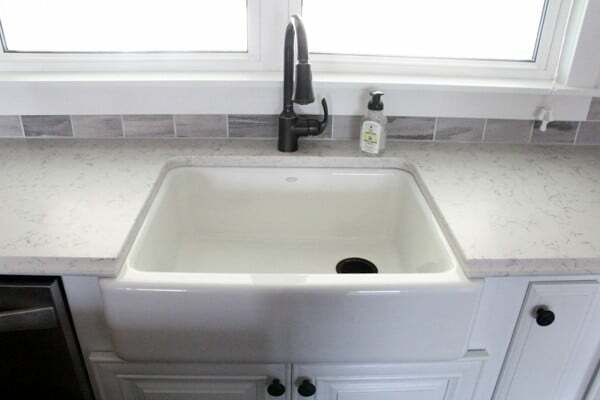 I was a little bit nervous about using anything other than typical white subway tile, since that’s what most modern kitchens are using, but I LOVE the way it turned out. I think the patterns and varying tones are stunning. I also love how it pulls the grey out in the counters. As much as I’m in love with the Quartz countertops, I’m glad we went with the wood island because it warms up the whole space. We finished the kitchen last weekend and I’ve already done a TON of cooking in it. I think the new space even makes doing dishes better! In case you haven’t been following throughout this journey, this auction house kitchen has come a LONG ways! I’ve been looking at the same backsplash! What was the color grout you used exactly? 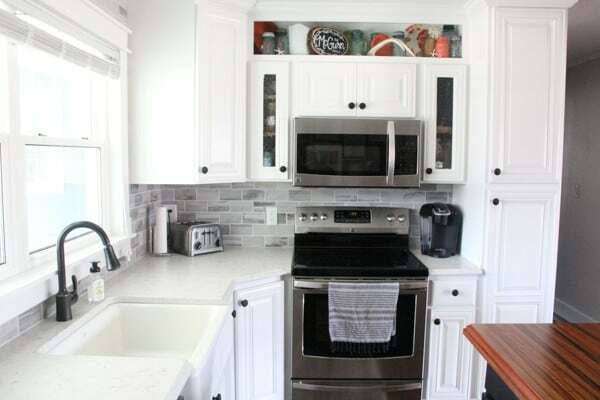 Also, my cabinets aren’t as bright white as yours, so do you think the coloring in the tile would make the cabinets look dirty? Thank you! I THINK that it was Accucolor “Dove Gray”. I wish I would have written it down. No I think this tile would look great with any color cabinets. It’s got a lot of variation in it. We loved how it looked. Good luck!